Anne Ochs is an elementary teacher who started writing in 2006 and began writing professionally online in 2010. She currently writes articles within the areas of education, parenting, fitness, home and garden. Ochs currently holds a Bachelor of Arts in elementary education and graduated from Regis University. Safflower oil comes from the safflower plant, which is part of the sunflower family. Safflower oil is colorless and odorless. It is used in cooking, salad dressings, paint, cosmetics, medicines and commercial products. It can also be taken as a nutritional supplement. Safflower oil can be found in supermarkets and health food stores. The safflower is an annual plant that blooms in the summertime. It can be grown in a variety of climates, but cannot tolerate very cold weather. The flowers of the safflower are red, orange or yellow and look like thistles. 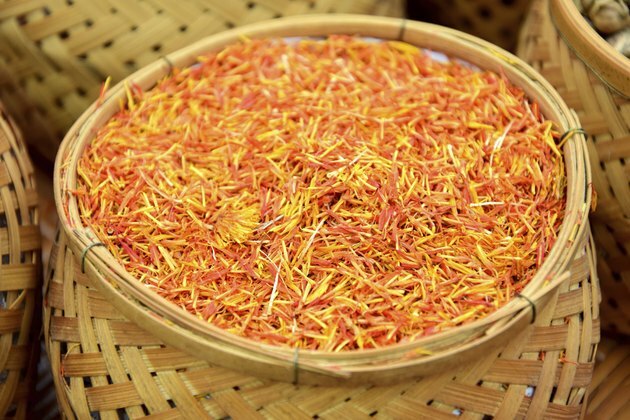 The petals of the safflower bloom fall off and expose the seeds, which are used to make safflower oil. Safflower is a very old crop. It grows naturally in Africa, Asia, India and the Mediterranean. Traces of it have been found in Egyptian textiles and tombs from 1600 B.C. During this time, safflowers were used to make dyes and garlands. Today, it is produced in 60 countries. Two types of safflower oil exist: polyunsaturated and monounsaturated. Polyunsaturated safflower oil contains linoleic fatty acids and is used cold. It has high nutritional value and is known as heart-healthy oil. It should be refrigerated or stored in a cool place. Monounsaturated safflower oil contains oleic fatty acids and is used primarily for cooking because it has a high smoking point. It is not as healthy as polyunsaturated safflower oil, but it is more shelf-stable. Minor side effects of safflower oil include diarrhea, nausea, vomiting, dizziness, loss of appetite and headaches. Serious side effects of safflower oil include hyperthermia, dyspnea (shortness of breath), chest pain, hyperlipemia (excess blood fat disorder) and thrombocytopenia (blood platelet shortage). Excess use of safflower oil may also contribute to obesity, diabetes and cardiovascular disease. Are There Any Bad Side Effects to Taking Safflower Oil?